Origin User always runs into the scenario that he/she wants to emphasize on a small region on the plot. Origin has the Screen reader and Data reader menu bar tool that enable user to obtain the coordination of the data points of interest. However what if the user has the need to save the interesting data points into a worksheet for more investigation? In this blog I will step you through the ways of extracting individual data points as well as a range of data points into a worksheet. Note: The instructions below are for Origin prior to Origin 2018b. Starting with Origin 2018b, an improved points picking mechanism has been introduced. It has been further improved in Origin 2019. 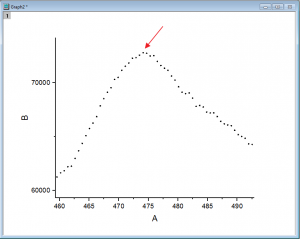 If you are using these newer versions of Origin, you can go to the Data menu and select Pick Data Points to select an arbitrary number of individual data points from any plot in a 2D graph. You can even initiate it by right-clicking on the floating Data Point Tooltip window in Origin 2019. Open Origin and start a new worksheet. 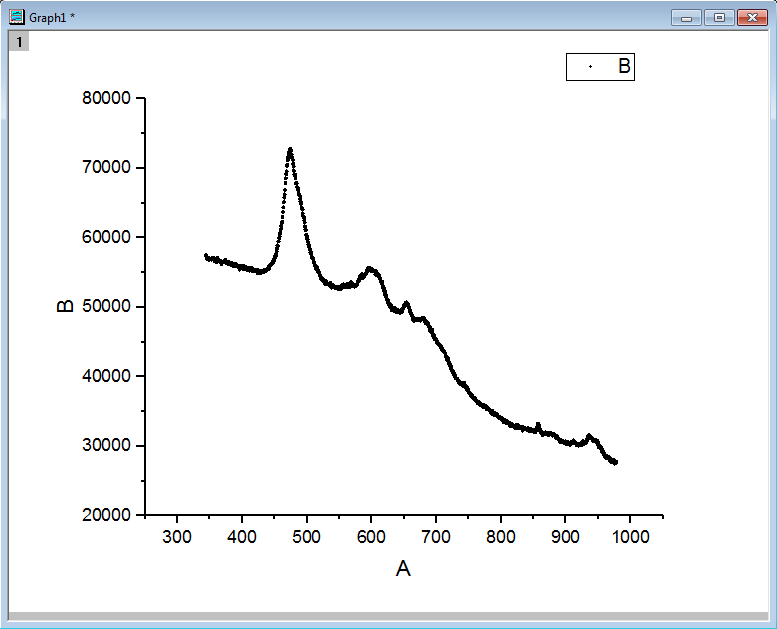 Import the Raman Baseline.dat under \Samples\Spectroscopy\ folder. Highlight column B and make a scatter plot. With the graph activated, go to Windows:Command Window (Shift+Alt+3). type pickpts and press Enter. The mouse cursor changes into a data reader cursor and a blank workbook is created to collect picked points. You can double click points on plot to collect them, or single click on a point. Then press Enter to collect. 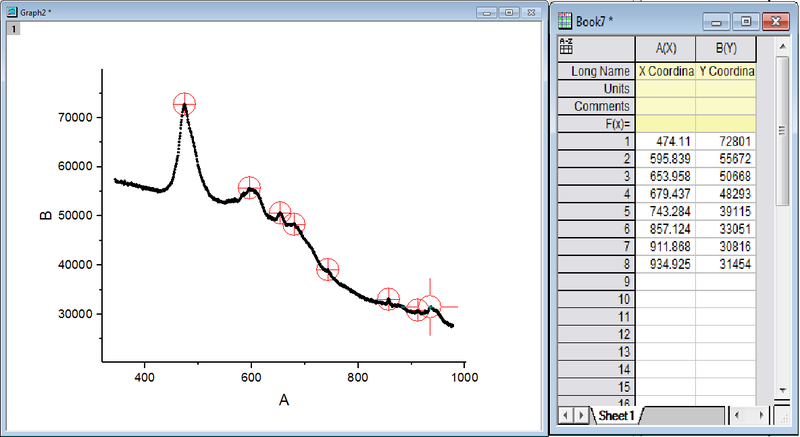 For dense plot like this, we can zoom in to pick points precisely. 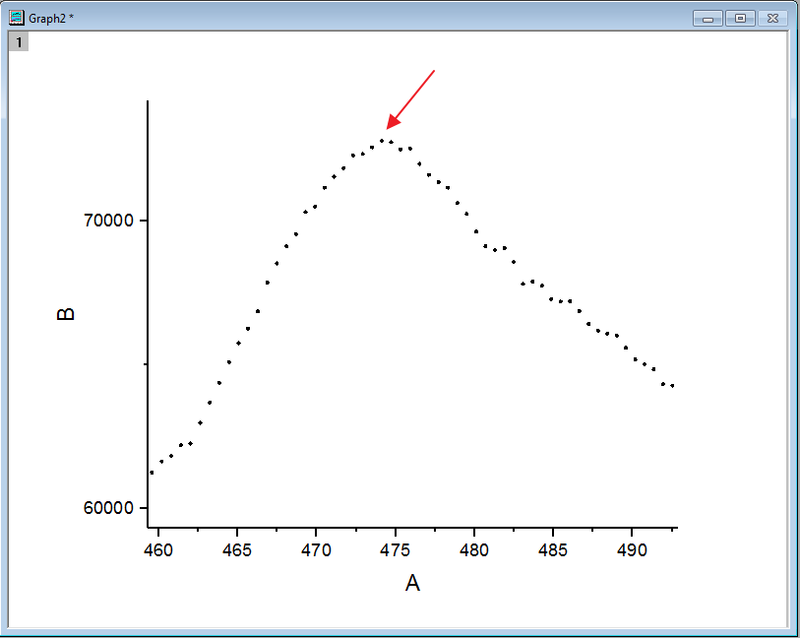 For example, To pick the peak around x=470, first move the mouse near the peak. With Z key pressed down, use mouse wheel to zoom in the x direction. you can also hold down shift+Z and use mouse wheel to zoom in y direction. With Z press down, you can also drag and move the curve with the mouse. The scale will change accordingly. More hotkeys can be found on the webpage. 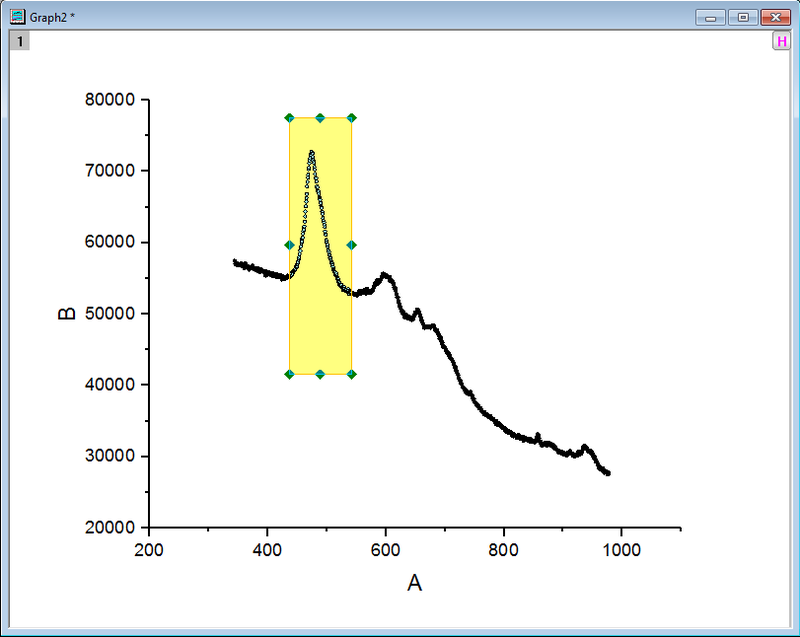 After playing around with these tricks, we are able to locate our mouse to the very top of the peak in the graph. Once we target the data points, double click or press Enter to select it. Then we can continue to select next point. After picking all points you are interested in, press Esc key to finish the process. All the data points’ ordinates are put to the workbook. This pickpts is an X-Function. 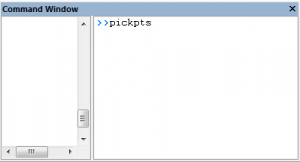 So you can run pickpts -d to open the dialog to see all options, including if you are using data reader or screen reader when selecting points. If you choose Screen Reader mode, you can pick places on the screen where there is no data plot. Pickpts can pick points on different curves and different layers. 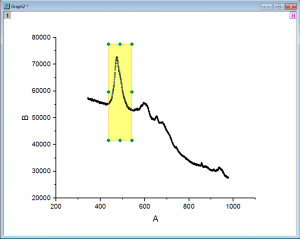 With the Raman baseline curve activated. Click on the left side menu bar. 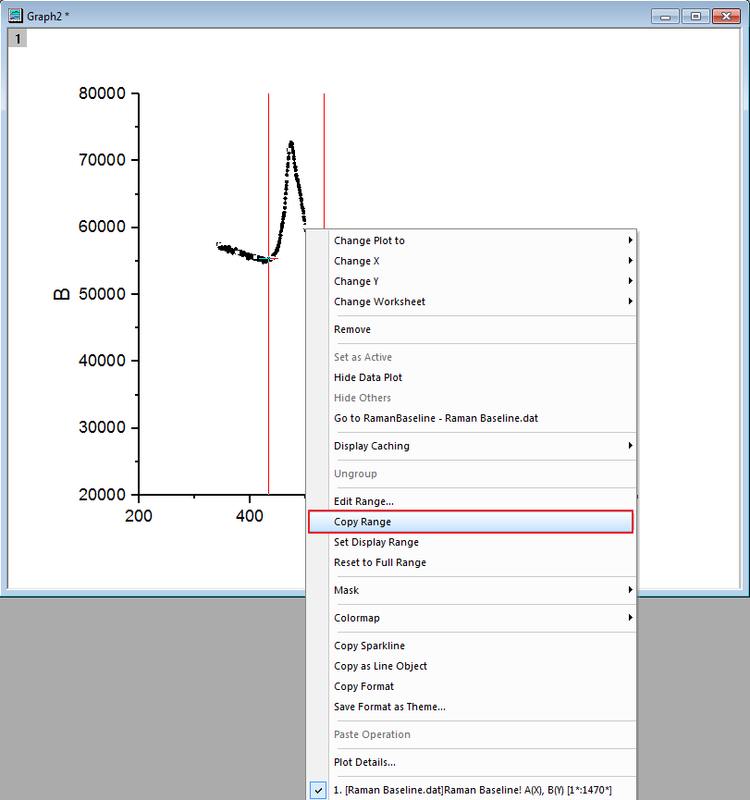 Select a range of data points in the curve and press Esc. Create a new worksheet. In any cell in the worksheet, right click and select paste to output the data. 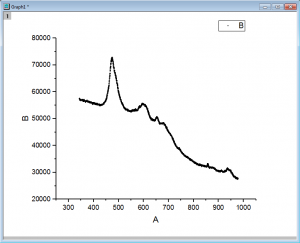 Origin also has the cluster gadget that can extract ranges of data points in the plot. With the graph activated, select Gadgets: Cluster…. 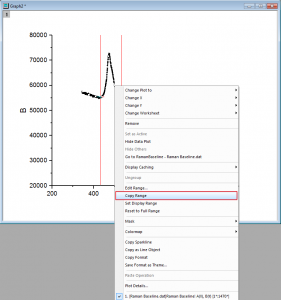 In the pop-up dialog, keep the default settings and click OK.
A setup dialog window pops up and a rectangle showing the region of interest (ROI) shows up in the graph. 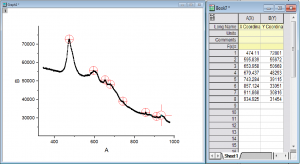 Move and resize the rectangular to cover the data of interest. Click the Copy Data button in the window. The data points covered by ROI is then copied. Create a new worksheet. Select any cell in the worksheet, right click and select Paste to paste the selected data. Now move the yellow ROI box to another region and repeat the process. Note: The Cluster gadget is a powerful tool. Other than outputing data points to worksheets, it can perform basic statistics on the clustered data, edit data points using menu options or buttons, etc. You can also switch between rectangular to elliptical ROI by selecting Settings:Using circular ROI Box . We won’t go to more details about this gadget. You may refer to this webpage as you desire. Note: Origin also has a useful tool called Digitizer which can digitize data from images or screenshot. With Digitizer, user imports from image file or clipboard and digitize data points by manually picking points one by one or using different auto tracing methods. If you are interested, please refer to this webpage.